Animation, Consternation and Elation An independent-study class at W&L allowed students to put together a short animated film from start to finish in only 12 weeks, but it turned out to be much more challenging than they expected. 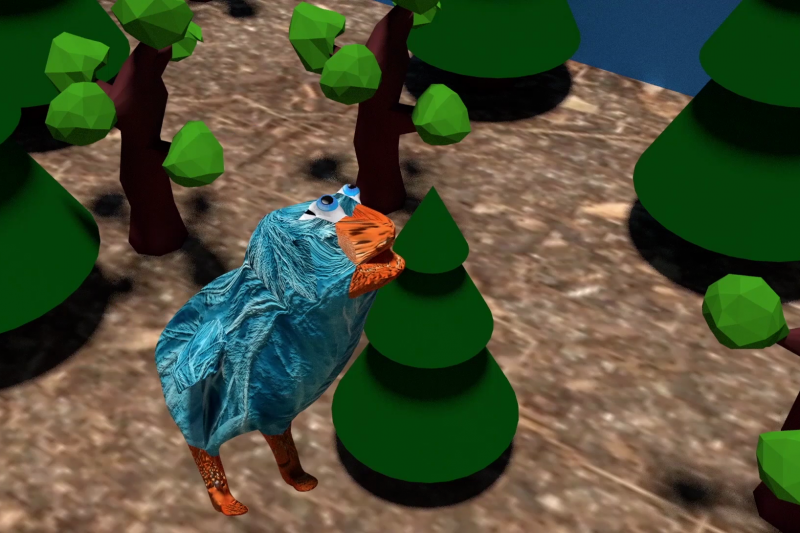 This still image from the final product of the 3D animation class shows one of the characters, a bird. One of Ellen Kanzinger’s role models growing up was her father, who started his career as a PE teacher but is now an IT specialist teaching skills such as graphic design and video game design. Kanzinger, a member of the Class of 2018, looks up to him because he has never been afraid to teach himself software programs such as PhotoShop, Blender or CAD. “He sort of moved over to a new career through his own hard work and determination, and I’ve always admired that in him,” she said. It was her father who came to mind when Gavin Fox, a professor of business administration and marketing in the Williams School at W&L, approached Kanzinger to ask if she’d like to take an independent study course in 3D animation. During the challenging 12-week course, students would craft a story, create characters, learn how to use Blender animation software, and put everything together into a finished short animated film. By the end of Winter Term, Kanzinger and the other three students who took the class — Jason Renner ‘19, Tory Smith ’18 and Jack Boyce ’19 — would pick up much of what they had hoped to learn. They also learned a few things they hadn’t anticipated, including the importance of adjusting expectations. Fox, whose research areas include service innovation and viral marketing, is similar to Kanzinger’s dad in that he loves the challenge of teaching himself challenging skills. It is not unusual for this Army veteran and father of three to stay up into the wee hours watching YouTube tutorials. The idea for the 3D animation class sprang from a Fall Academy session in the IQ Center at W&L, where Dave Pfaff, the director of the center, allowed guests to test-drive the virtual goggles. That got Fox thinking about animation and the possibility of creating a class that would be, in his words, “the ultimate liberal arts project,” as it would require elements of language and storytelling, design, film, acting, engineering and much more. As the class got underway, the students envisioned an animated short film that would resemble a Cartoon Network show — something perhaps a bit more crude and beginner-level than a Disney film, but pretty slick nonetheless. By the end of the course, as they scrambled to simply complete the film on deadline, their goal had shifted dramatically. First, the students got some guest lectures from professors Jemma Levy, Stephanie Sandberg, Leigh Ann Beavers and Chris Gavaler, who gave them pointers on writing, drawing, acting and storyboarding. Then, they set out to come up with a storyline, script and characters. They settled on the simple parable of a lizard and a bird who are competing to get the worm. In Blender, a software program for creating 3D computer graphics, the students began to learn how to make shapes and landscapes, and to add color and texture to those features. But as soon as they dove into Blender, they realized they were in the deep end — it may be a free program, but it is certainly not easy. When it came time to animate the characters with the captured movement, they hit a big impediment. Since the program used for motion capture is designed for human movement, it turned out to be virtually impossible to transfer Smith’s movements into the body of the bird. As a result, the bird’s role in the film turned into more of a brief cameo. “It’s not like they had a year to learn Blender, so they were gaining proficiency at it as they went,” Fox said, “which is why, when you look at a lot of the shapes, they were very basic.” He offered some lessons and tips throughout the process but primarily encouraged students to solve problems they encountered independently. When the animation was finished, the students still had to render the content, which required them to set aside a large chunk of time on finals week. For example, Kanzinger said, a seven-second scene can take three hours to render (the finished film is about 90 seconds). The students — and their professor — said there was a point when they didn’t know if they’d be able to finish the project in time. But rendering ended up being the least stressful part of the process, and they were able to finish early. “By the end of the semester, with the deadline for submission approaching, I was delightfully surprised to see every member of the team contribute in meaningful ways to help out together a project that far surpassed my expectations earlier in the semester,” Renner said. Fox said he had a whole range of possible outcomes in mind when he decided to teach the class, and he was pleased that the project came together. Part of the learning process turned out to include when to cut corners and prioritize when coming up on deadlines. Kanzinger and Renner both said they appreciated the challenge and the opportunity to take a class they never thought they’d be able to take outside an art or design school.